Prime and prepare your smoker based on the manufacturer’s instructions. Choose a mild-tasting hardwood like apple wood. While your smoker is heating, rub the meat with all the spices. Smoke the seasoned meat for 30 minutes at 175 degrees Fahrenheit. Then turn your smoker up to 300 and roast the meat for one hour or until your meat thermometer reads 130 degrees. Remove it from the smoker and allow to rest for 15 minutes. It will rise in temperature to around 140, the perfect internal temperature for serving. Slice the meat as thin as you can and load up the brioche buns. 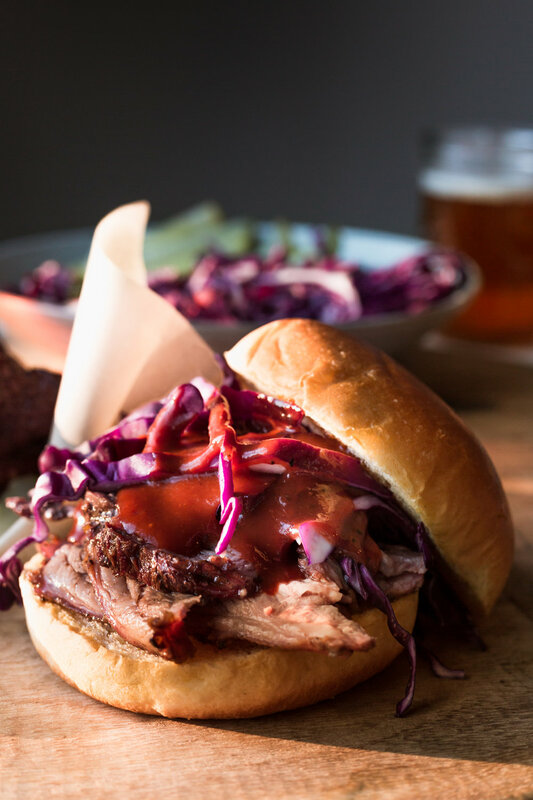 Top with sauce, cabbage, and pickles for an incredibly juicy, smoky amazing sandwich!